Russell Brunson Perfect Webinar is second to non when it comes to producing a profit punching webinar. Russell Brunson Perfect Webinar – Video One. 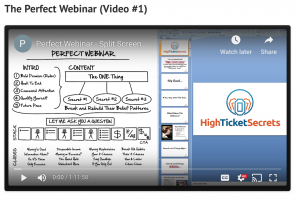 Inside the perfect webinar secrets membership there are two videos. Here we will go over the content available in video 1. Russell Brunson begins with showing how important it is to get your audience hyped up. Plus willing to stay till the end of the webinar. Many webinars have offers towards the end. So it’s important to keep people watching or they will never get to see the pitch ! Want more FREE stuff ?